What Is English Clotted Cream? If you're British, then clotted cream is like what apple pie is to Americans. Like the name suggests, yes, it is cream, but what is the clotted bit all about? Clotted cream is a silky, yellow cream with a distinctive crust on the surface. The cream is made by heating unpasteurized cow's milk in a shallow pan for many hours. The cream rises to the surface and clots or thickens. This thickened cream is skimmed off the top and is served with scones, afternoon teas, and on summer berries. The cream should have a firm crust and underneath it should be a thick, smooth, and utterly delicious yellow cream, which is about 55 percent butterfat. Cornish clotted cream is a holder of the EU's Protection of Designated Origin. That means it can officially be labeled as highly coveted Cornish clotted cream if it is produced from milk from Cornwall and it is 55 percent butterfat. The unique, slightly yellow, Cornish clotted cream color is due to the high carotene levels in the grass. It is believed that clotted cream originated in Devon and Cornwall in the southwestern corner of England. But, it is also successfully made in Yorkshire (which does not sit very well with the those from the Southwest). For example, Stamfrey Farm in Yorkshire has been successfully making the cream on their farm now for many years and has scooped up many awards for its clotted cream. Although the British are known for their clotted cream, there is some folkloric evidence to suggest that the Cornish people may have been introduced to this preparation by Phoenician traders looking for tin around 500 B.C. It is similar to kaymak, a Middle Eastern delicacy. A cream tea is a nice way of saying a light meal with afternoon tea. 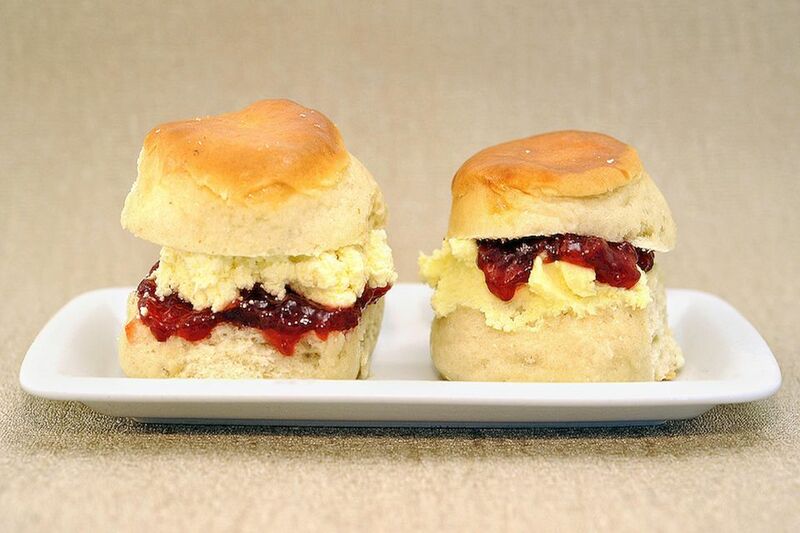 Clotted cream is an essential component of either a Devon or Cornish cream tea. It would be unheard of to have a cream tea without clotted cream; it is served in place of butter. The cream differs in each county as one spreads the cream on the scone, then tops it with jam, or puts the jam on first and then it's followed by the cream. The cream is not restricted to the afternoon teas, though it is used in much the same way as double or thick cream. In the summer months, a huge dollop of clotted cream goes well on fresh strawberries or any berry for that matter. The two together are the actual foods of the season. The famous "Strawberries and Cream of Wimbledon" sounds like it should use clotted cream, but it does not. That special dish is made with thick or whipped cream. Just as there are ways to use it, it stands to reason that there are ways to not use it. Clotted cream cannot be whipped and is too thick to use in or on a cake. Clotted cream is not good to use in cooking in the same way that other creams are. Unlike other types of cream, the clotted variety travels very well, and because of this, the cream was sent through the mail for decades and to all corners of the world. The simplest way to find it is online. Make sure it comes from Devon or Cornwall to ensure what you are buying is authentic (unless you are buying it from Stamfrey Farm, then you should be okay).